This is one of my essays on 18th century cowkeeping. On the left are links to the sections in this essay and its drill-down extended footnotes, and to the Contents page. To keep it simple, my bibliography and list of useful websites is at the end of the Introduction. "The Milkmen, since Michaelmas-Day last, have advanced the Price of Milk to Two-pence Halfpenny per Quart, which they purchase, Winchester Measure [=39.2 fl oz], and retail at Wine Measure [=33.3 fl oz], and which, exclusive of the Adulteration of that Comodity, is the most scandalous Imposition on the Public that has happened in the present Age, since within these few Years good Milk used to sell at One Penny Farthing per Quart." For those readers below a certain age, One Penny Farthing was half of Two-pence Halfpenny. So anyone with £1 in 1765 could buy 48 quarts (enough to bath a small child) but it might take two weeks to earn £1. "One Cow-keeper near Kingsland lost no less than £70 last week, on account of raising the price of his milk, all his customers having deserted him on that account." "Before the late Rise of [the price of milk] the Price was Three Half-pence per Quart ; at present Two pence, Milkman’s Measure, to which it is difficult to fix any Standard, since hardly any two of them are alike. However, those that chose Winchester Measure (a Measure by which I apprehend they are all bound by the Law to retail Milk) may have it at Two-pence Half-penny a Quart. ... Milk was formerly sold at Five Farthings the Quart, but the honest Retailer found Means to raise it to Three Half-pence where, for some Years they have kept it, but now advance even upon that. ... Let us now consider the Difference this ... makes to a poor and numerous Family of, we suppose, four (which is a very modest Calculation). If each has but one Quart a day, this will make a Difference in the Year of upwards of Three Pounds which is, perhaps, as much as the whole Amount of their Rent. ... our Magistrates, that are so particularly careful of the Alehouse Measure, suffer that of the Milkman to pass unnoticed." 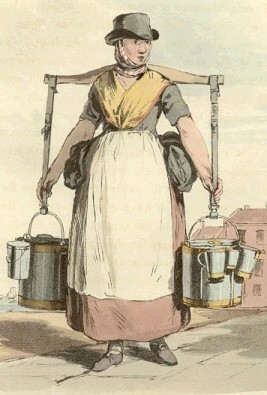 This milkmaid is carrying a range of different-sized measuring jugs, each of which was supposed to have a very specific capacity (see Winchester measures below). They look as if they are made of tin and copper, which would be easy to clean and sterilise although hygiene regulations for cow-keepers were not introduced until the 1880s. "We are told that a plan is under consideration for lowering the price of milk, and obliging the retailers of the same to sell by statute measures, agreeable to law." The newspapers highlight three major periods of customer anger at price rises during the 18th century: the one in the mid-1760s which caused the previous correspondence, and two more following the disastrous harvests of the 1770s and 1790s. The papers were full of diatribes against greedy and profiteering cow-keepers, pricing their milk out of the reach of starving families. The problem was partly because of the already-mentioned blatant misuse of the standard Measures, and partly because the cow-keeper sold to the milk-dealer at so much a quart, and the milk-dealer sold to the customer at a-bit-more a quart, and the smallest value coin was a farthing – one quarter of one penny – so even a one-farthing increase hit the household hard when one quart of milk cost tuppence and a man was lucky to earn 144 pennies (12 shillings) a week. Anyone who remembers Britain's changeover to decimal currency in the 1970s will also remember the indignation at the smallest coin now being a half-penny and we all muttered about shopkeepers keeping the profit. "Yesterday most of the milk carriers in London and Westminster began to raise the price of milk from two-pence-halfpenny to three-pence per quart. The carriers lay the blame on the cowkeepers, the cowkeepers on the brewers, having raised the price of grains to them. A few years ago milk was sold for three-halfpence." "Supposing, for instance, the increase upon the price of grains to the cow-keeper, in a large business, to be four hundred pounds this year more than it was last (and certainly this is more than a sufficient allowance for the difference in the price) and supposing an increase of expence for other articles of provender for his cattle to be three hundred pounds; yet, when we consider that the cow-keeper, who makes this consumption of provender, and is at this additional expence, sells to his several dealers not less than two hundred gallons of milk a day, for which he is paid an additional price of four pence a gallon [1d per quart], we shall find him a very considerable gainer on the whole, at the advanced price of milk; for he will have near one thousand three hundred pounds more for the same quantity of milk this year than he had ever before. And it ought to be remembered, their harvest for hay this year was remarkably fine, and the hay they made extraordinary good, and at a much less expence than they have done for many years. In this article of hay some farmer at Islington acknowledged it had not cost him, by three hundred pounds, so much as last year. From this plain simple state of facts, it appears that the advanced price of milk is owing to no other cause than a combination of the cow-keepers; and there is no really necessity to occasion it, [signed] TRUTH "
but this was quickly refuted by A MILK DRINKER, with a long contradictory argument detailing some of the cow-keeper's costs of fodder and transport, and stating an average daily yield of six quarts. "Yesterday a number of poor wretches in Spital-fields, oppressed by the very high price of milk, stopped two Milkmen, and obliged them to retail it at 2d the quart. One man refusing to comply, they turned all his milk into the channel." "The cowkeepers near Sheffield have been frustrated in an attempt to raise the price of milk from 1¾d to 2d the quart, by a meeting of the inhabitants at the Town hall, where a subscription was opened for defraying the expence of bring milk from a further distance; in consequence of which the milksellers of the town dropped their resolution." Cow-keepers normally kept the Holderness short-horned cows, because of their high milk yield and leaner meat. Cows were bought at the age of 3 or 4, in calf, at a price (Feb 1798) of 20 guineas each. Average yield was 9 quarts a day, equal to 3,285 quarts per annum (less 85 for the new calf), giving (at 17d) £28 6s 8d from milk + £1 3s 4d from the sale of the 3-day-old calf = £29 10s income per cow per year. Feedstuff cost £18 per cow per year, leaving £11 per cow per year to cover replacements, losses, waggons, rent, wages, and profit. Cows were kept for four to seven years, then fattened (every farmer had his own secret recipe) and sold to the butcher. Overheads also included one bull for every 30 cows, and one cowman for every 60 cows. "A correspondent at Stockton [Co Durham] informs us, that a farm of about 70 acres of meadow and pasture land, situate near that place, and belonging to Rowland Burdon, Esq, MP, has lately been lett to a respectable tenant for six years: The conditions of letting this farm are well worth the attention and imitation of owners of lands adjoining populous towns, and are as follows:- “The tenant will be required to covenant to keep at least ten cows, and to retail the milk to the inhabitants of Stockton. A deduction of £20 a year will be allowed out of the rent, on condition that the whole of the new milk be retailed, unadulterated, at or under one halfpenny a pint.” The above farm was held for several years by the late Mr Thomas Catterick, cow-keeper, in Stockton." "It was resolved, That it be strongly recommended to every Inhabitant to refuse purchasing Milk for their families at more than three-pence halfpenny per Quart, Winchester Measure ... [also] that the Inhabitants, after paying the present price for Cheese and Butter for Three Weeks from this day, do not pay more than 1s per Pound for best Butter, 10d per Pound for the best Salt Butter, and 9d per Pound for the best Cheese." "There are probably not so little as 10,000 cows which give milk to the metropolis; but supposing only 8,000, the annual profit in milk is the enormous sum of £462,200. The capital necessary to purchase and keep fodder beforehand for 8,000 cows, at £30 per head, is £240,000, so that the capital is nearly trebled every year, being an annual profit of almost £200 per cent." "A cowkeeper informed me that the retail milk-dealers are, for the most part, the refuse of other employments; possessing neither character, decency of manners, nor cleanliness." which seemed to sum up the attitude of the public to their milk-dealers. "To found a great empire for the sole purpose of raising up a people of customers, may at first sight, appear a project fit only for a nation of shopkeepers. It is, however, a project altogether unfit for a nation of shopkeepers, but extremely fit for a nation whose government is influenced by shopkeepers." "The state of society in this country has undergone a great change. There was a time when there existed a happy gradation from the monarch to the day-labourer. Time was when a London Shopkeeper, by sobriety, industry, and economy, could afford to live on small profits, and save wherewithal to bring up an honest and useful family. His shop employed him through the week, and he took his family to church, and to a healthful walk in the fields on Sunday. His wife was his cook and sempstress, and the nurse of his children. Now he is a puny shop-keeper indeed, who has not his town-house and country house, and carriage, and compleat set of servants and box at the theatre, and lodgings of ten guineas a week for two or three months in the summer at a watering place." In other words - 'How dare they want what I've got'. Not much changes. leaving 12s 9d available for saving out of a £50 0s 0d notional annual income. 4½d for Supper: bread and cheese with radishes, cucumbers, or onions: 3d, small beer and half a pint of porter: 1½d. "I have now conducted your clerk thro’ the expences of a year, in which, tho’ some articles may have been omitted, none will be found superfluous, none over-rated. For the common entertainments of life, such as almost all people partake of, I have left him wholly dependent upon the bounty of others, not allowing him, at his own cost, one night at Sadlers-Wells, one drop of wine or punch, one dish of tea or coffee ... one pipe of tobacco, or one pinch of snuff. 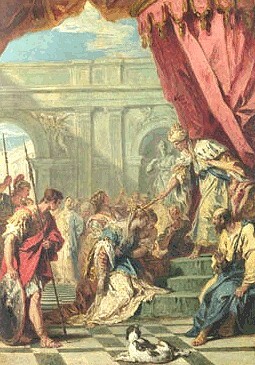 "I have driven him to the dirtiest and meanest parts of the town to seek for a cheap lodging; I have cloathed him in the plainest and coarsest manner; I have scarcely allowed him to be clean enough for the place of his stated appearance; I have fed him ... even worse than the day-labourer feeds himself ... and, yet, with all this economy and penury, the wretch, at the year’s end, has no more than twelve shillings and ninepence to lay by for sickness and old age." "Suppose a Person having such a Family, does by great Industry earn 30s weekly, there will be an annual Loss of £3 13s 4 ½ d. But no Allowance is hereby made for Cloaths or Pocket Money, not even the Gratification of a single Pot of Porter thro’ the Year is admitted. If so deplorable then by the Situation of a Man who can get 30s weekly, what must become of that Family the Father of which cannot earn half the Money?" I apologise for mixing metric and imperial measures in this essay – it is just about to get worse, because milk was measured very strictly according to the Winchester assize. Since about 1300AD (when the King was based at Winchester) commodity measures were controlled by the state, which arranged for the manufacture and distribution of a set of standard measures to be used in every city. With commodities like bread and beer, local Assizes then regularly linked volume and selling price. 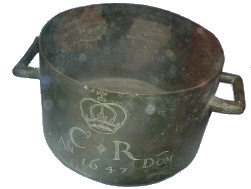 This measure, which we photographed in the Salt Museum at Nantwich, was issued in the name of Charles I in 1647. The Winchester standards applied to bags of wool, and coal, and salt, as well as the more familiar bushel of wheat. Each city had to pay for its set of measures, naturally, but at least it meant that anyone – customer or retailer – could check locally that they were getting their money’s worth. Heavy fines were imposed by magistrates on any supplier who skimped – hence the ‘baker’s dozen’ where the baker added one loaf just to be sure of coming up to weight. Local authorities still have Weights and Measures officers and in fact the Assize price of bread, for 1lb and 2lb loaves, has never been repealed. Under these rules the weight of loaves sold for a farthing and later a penny was fixed according to the price in each locality of a bushel of wheat, and the size of the resulting loaf depended on the harvest. The Winchester standard specified volume rather than weight, and the given measure for milk was the quart – 39.2 fluid ounces – which resulted in our English 20 fl.oz. pint. The American pint at 16 fl.oz. must be based on another Winchester measure – the Wine Measure of 33.3 fl.oz. per quart. There were four quarts – eight pints – in a gallon. Even given these fixed measures, the less honest milk dealer could, and did, buy from the cow-keeper in Quarts at so much a quart, and then sell to his customers using the Wine Measure but charging the Quart price. The Winchester measures were the standard until 1824, when Parliament introduced the Imperial measure where one pint equalled 20 fl.oz. (or floozies, as they were known in our house). But this was after the American revolution so there was no requirement for a trans-Atlantic standardisation and the American pint remains at 16 floozies. Please be warned that I later came across ‘barn-gallon’ when reading about wholesale milk prices - a barn gallon was apparently about double the volume of a Winchester gallon - aarrrgh. I have had to assume that all the prices discussed in the newspapers were based on the Winchester measure of 4xquarts=1 gallon, but I can give no guarantees.